Open edition of signed and numbered red on gold Abhayakaragupta screen prints available in A4 size (12 x 9 inches). Khedrup Gelek Pelzang (1385-1438), more commonly known as Khedrub Je, was a main disciple of the great scholar Tsongkhapa, who established the Gelugpa or 'reformed school' of Tibetan Buddhism and founded the great monastery of Ganden near Lhasa in 1410. Although Tsongkhapa had many illustrious disciples, including the First Dalai Lama Gendun Drub, he is invariably represented with his two main disciples, Gyaltsab Je and Khedrub Je, appearing at his right and left sides. Gyaltsab Je (1364-1432) became the next Ganden Tripa or 'throne-holder' of the Gelugpa tradition after Tsongkhapa's death, and was then succeeded by Khedrub Je, who had also founded his own monastery of Baiju near Gyantse in 1418. Khedrub Je was born in the Tibetan province of Tsang in 1435. He traveled and studied widely, and was ordained by the Sakya master Redawa Zhonu Lodro, who was also one of Tsongkhapa's main teachers. 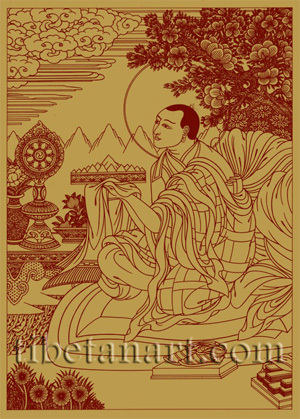 Khedrub Je was recognized as an emanation of both Manjushri and Amitabha, and posthumously as the first incarnation of the Panchen Lama. He was a prolific writer whose fifty-eight treatises appear in the nine volumes of his collected works, and his extensive commentary on the Kalachakra Tantra is used during the many Kalachakra Initiations that H.H. Dalai Lama has given over the last four decades. He also wrote a biography of Tsongkhapa. This drawing is based on a wood-block print from Narthang monastery that was carved in the eighteenth century, which shows Khedrub Je presenting a symbolic offering of the entire universe in the form of a mandala.